The Residual Deviation Bands are comparable to Bollinger Bands and our Multi Deviation Bands. However, the deviation is not directly calculated from price data, but it is based on the residuals from the selected moving average. Residual deviation bands do not expand and contract as much as Bollinger or standard deviation bands. They are better at containing price action, but are less suited to determine whether markets are trending or rangebound. The Residual Deviation Bands consists of a midband and an envelope. You may select one of over 30 different moving averages as the midband. Midband and envelope are colored according to the slope of the midband, which can be upsloping, neutral or downsloping. There is a parameter to adjust the flatness which is considered as neutral. All slope calculations are volatility adjusted. The sign of the slope is exposed as public property and can be used as a trend indication. The trend can also be shown via paintbars. For calculating the deviation bands, 3 different formulas can be used. The default setting uses the residual mean absolute deviation (RMAD) from the selected moving average. Alternatively, the residual median absolute deviation (RMAD) or the residual root mean square deviation (RRMSD) can be used. The upper band is obtained by adding a multiple of the deviation to the midband, while the lower band is obtained by subtracting a multiple of the deviation from the midband. Unlike for classical Bollinger Bands or Keltner Channels you may use different lookback periods for calculating the midband and the deviation. 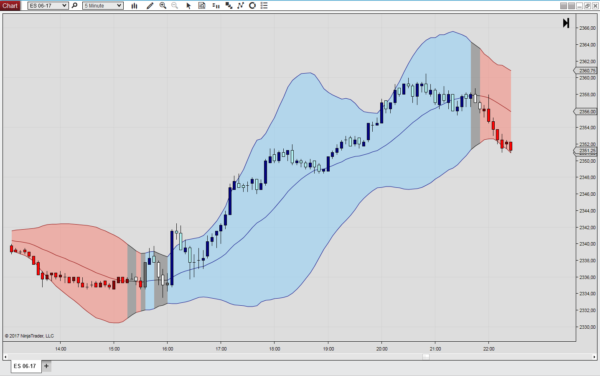 The Residual Deviation Bands give you an indication of the likelyhood that price action may revert. The band width of the Residual Deviation Bands mainly depends on the dispersion of values around the central tendency that has been selected as midband. It does not take into account whether the market is rangebound or trending. Unlike Bollinger Bands it should not be used for identifying a squeeze or breakout move. However, it can be used for exiting positions or adjusting stops.